Outlaws & Villains, A Collection of Previously Published Articles From History Magazine; by; 52 pps; 8.5x11; Item # MM010; PDF downloadable eBook, Downloads are available immediately upon placing order. This book is no longer available in printed format. Their names are infamous. They have been the subjects of movies. They are mentioned in history books and classrooms across North America. They were bank robbers, gang leaders, and murderers. They are America’s most notorious Outlaws & Villains. But how much do your really know about them? What was their history? You can now find out. History Magazine put together a collection of previously published stories into a single publication called Outlaws &Villains. 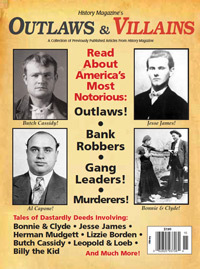 The one time special issue covers the life stories of some of the most well know names in criminal history: Jesse James, Butch Cassidy, Al Capone, Bill the Kid, Bonnie & Clyde, and many more. Family Roots Publishing has managed to acquire back issues of Outlaws & Villains and are making them available while supplies last. The stories are not all what you might expect. Sure, we know their most infamous deeds. But, they were once someone’s child. They didn’t all seemed destined to a life of crime. Bonnie Parker, for example, was known as a bright student who won literary prizes and wrote poetry. But, she apparently liked bad boys. She married at 16 to a man who ended up in jail just three years later. Not long after she met Clyde and the rest is well-known history. These stories are a great read. Photographs, sketches and posters bring these criminals to life. Their deed affected the live of our ancestors in the same way modern criminals and deeds affect our own. Milt Sharp AKA The Polite Bandit, Eric Bryan tells the tale of an outlaw known for the polite treatment of his victims!